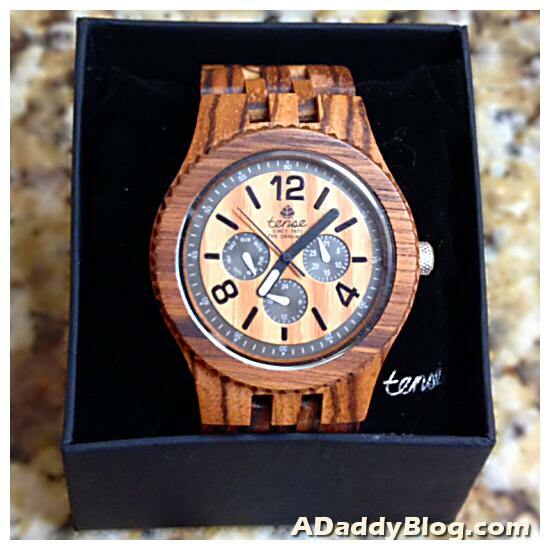 Disclosure: The folks at Tense provided me one of their wonderful wooden watches for review purposes. My opinion is never for sale, and as always my thoughts in this product review are 100% my own. Do you like getting things in the mail? Personally I do everything I can to reduce junk mail and the added clutter and paper pollution it brings into the world. BUT getting packages in the mail conjures happy feelings from my childhood at the excitement and possibilities of treasures within. My grandparents traveled a lot, and often the boxes arriving in the mail at our home contain exotic gifts from faraway lands. Many of these gifts were hand-made wooden crafts. In fact our home today is largely decorated (and floored) in warm wood, including many of my childhood treasures. And so yesterday when the box from Tense arrived I was pretty excited. As far as jewelry goes, I only wear a hand-hammered gold wedding band… and a watch. 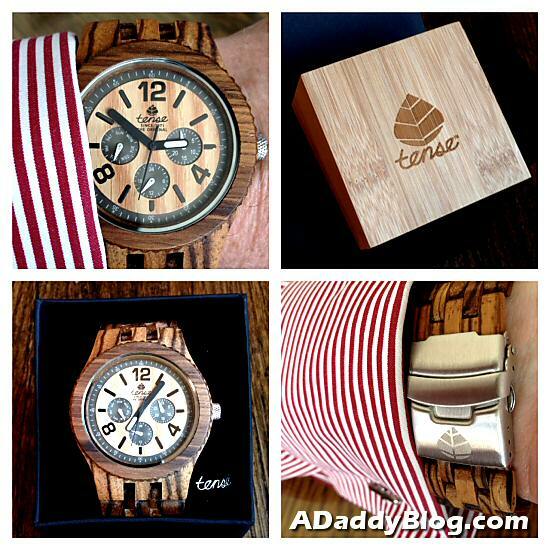 I must admit I was intrigued by the idea of wearing a watch made of wood. There’s something comforting, even grounding about it. My Tense wooden watch arrived packaged in a lovely box, with a top made of, what else, wood. The presentation would be super for gift giving. Inside was my gorgeous natural solid Zebrawood timepiece. Tense sells a wide variety of styles for men and women, in a mix of different woods from around the world. My new Tense wood watch is over-sized in the style that’s über popular now. It’s almost identical to my previously favorite watch, with its multifunction dial, indicating the date, 24-hr time, and day of the week… except it’s made of wood. The band has a secure locking, push-button stainless steel clasp. In a nice touch, Tense includes the necessary tools to adjust the size of the band. This is accomplished by removing unneeded links. Note: with many less expensive watches you must (gently) hammer out the pins holding the links. These unscrew, and as such are much easier to adjust in my experience. If you’ve not heard of Tense wooden watches before, they are not new kids on the proverbial block. Tense was founded in 1971, and this purveyor of high quality wood time pieces is owned and operated in British Columbia, Canada, one of (they say) the most beautiful places in the world. I agree. They design and manufacture all of their products in Canada, and in case you’re concerned about a wooden watch keeping good time, all of their products use one of the world’s top watch movements, Miyota 2035, from Japan. Their wood comes from Africa, India, and many other exotic places. 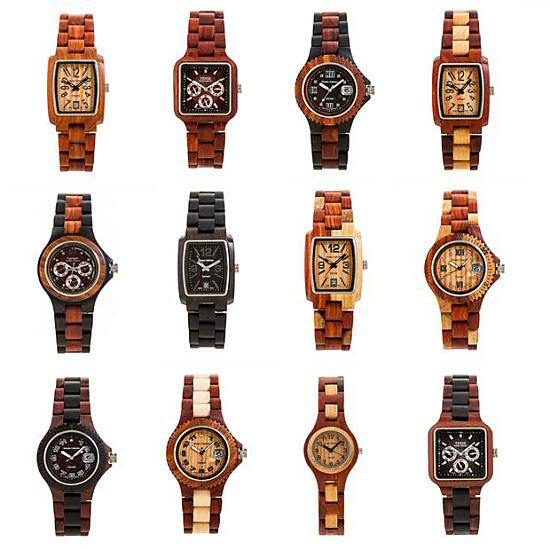 To view their catalog of wooden watches you can visit them at tensewatch.com. My watch pictured above is the Vernon model j5203Z. The “Z” is for the cool Zebrawood it’s made from. Other woods include sandalwood, rosewood and butternut, among others, including multi-wood combinations. There are so many great choices for both men and women you should go check out their site, even if it’s just to “window shop”. I’m curious. Do you wear a watch? For a while people wore them a bit less, using their phones as their watches, but that’s changed. Personally I don’t feel properly dressed without one.